Ivan, Jennifer and I checked out of the Swiss Bel-Hotel on June 17, 2009. We got a taxi to the train station. We were headed to Yogyakarta. 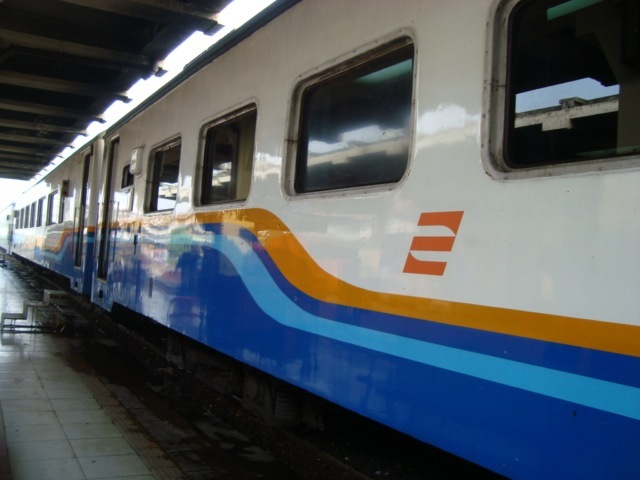 Ivan and Jennifer bought Executive seat tickets for the train at 150,000 IDR each. We went to sit down on the train. Lunch was included with the seats. It was Nasi Goreng and a banana. Jennifer kindly gave me her banana. We all slept a lot on the train. We arrived at 4:15 pm in Yogyakarta (pronounced Jogyakarta). We checked in to Puri Artha Hotel. 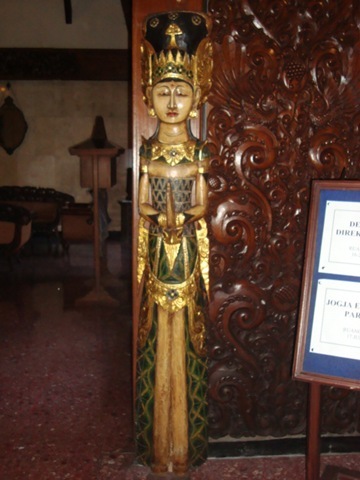 It’s a great hotel with Javanese and Balinese artwork everywhere in the hotel. The pool area has a dragon near the pool. 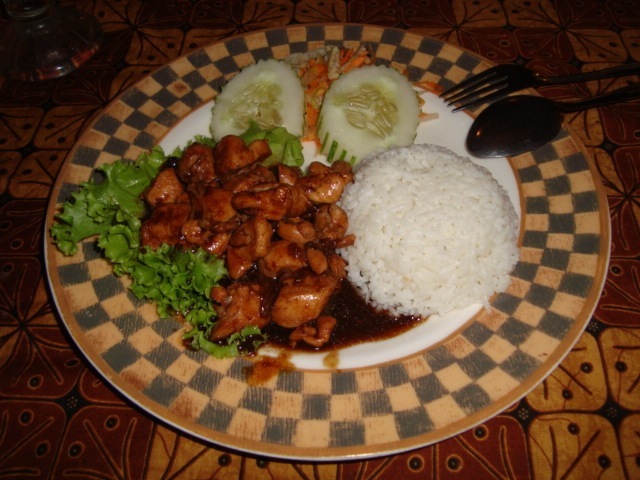 The hotel is located a few minutes from the main area of Yogyakarta. It was tea time in the Chandra Bar. The tea and snacks are complimentary. 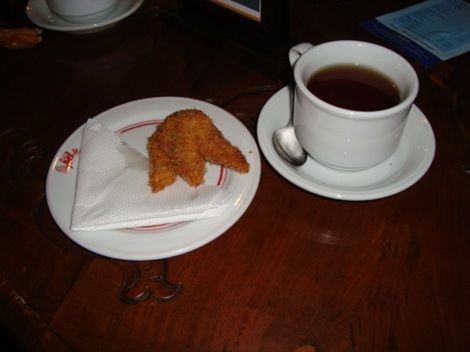 I had Ivan’s yummy fried banana. We had lunch in the Chandri Restaurant. Ivan had asparagus soup and salmon with potatoes. I had noodles with chicken and bananas. Jennifer had the Nasi Goreng. The food was good. We watched tv in the room. Ivan used the internet. There is free wi-fi in the rooms and in the bar and restaurant. A computer in the lobby is free to use for guests. Ivan, Jennifer and I had the free breakfast buffet at Puri Artha Hotel on June 18, 2009. I had bananas and yogurt. Ivan and Jennifer had some toast and cereal. Ivan also had some boiled eggs. Ivan worked on his blog. Jennifer and I watched tv in the room. We had lunch at the Chandri Restaurant in the hotel. Ivan had the salmon curry with rice. 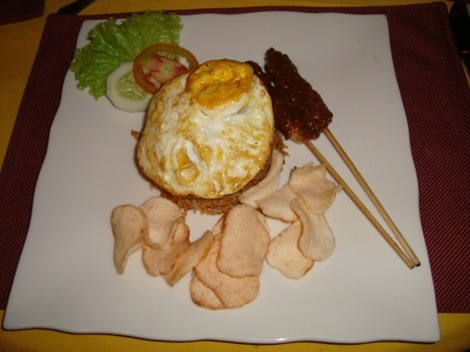 I ordered the Nasi Goreng with Bananas. Jennifer had Spaghetti Marinara. The food was tasty again. Ivan went to chill at the pool. Jennifer read Season of the Machete by James Patterson while I worked on the blog. We took a taxi to the main street of Yogyakarta called Malioboro. We walked around to find the Bedhot Restaurant. It’s a restaurant with colorful artwork on the walls. Ivan got the guacamole and the chicken porridge. I had the banana pancakes. Jennifer had the chicken teriyaki. The food was alright here – nothing special. 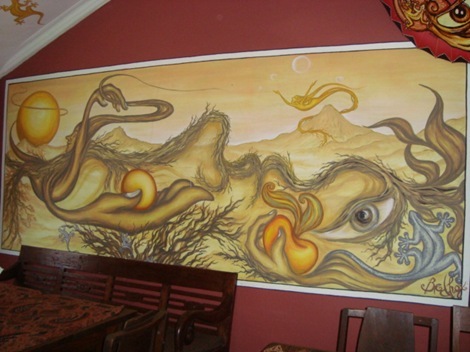 Ivan set up a batik painting class with the restaurant. The class is held 100 meters away from the restaurant. It was set up for Saturday (two days time). We started walking outside the restaurant. The guy we set up the class with came out. He said that the teacher had something already set up for Saturday. Ivan decided to do the class tomorrow. We walked around Malioboro. There’s a lot of souvenirs shops on this street. We headed to the hotel soon after to get some rest.